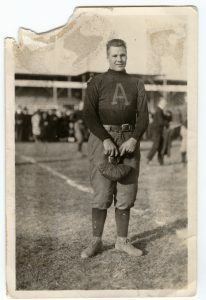 Leslie Cranfill (’24) was a Wildcat who played football at Fair Park. Most people who live in Abilene, or have been to school here, know the names of the major streets: Ambler, Treadaway, Sayles, North 1st and South 1st, Willis, Leggett. Most people have driven by Rose Park, in the center of town, and driven on Highway 80. But most people don’t know the history behind these streets (some of which were misspelled and left that way on purpose) and landmarks – history that is, literally, in plain sight. David Gibson (’91), director of computing services at ACU, and Jay Moore, history teacher at Abilene High School, are creating and filming a series of videos about Abilene’s local history, focusing on local interest items such as the ones described above. Their first two videos, on the Bankhead Highway and the three-part “Who is That Street?,” can be viewed on their YouTube channel. The duo’s latest production, “Fair Park of Abilene,” debuts locally tonight in a public showing in the Elks Building ballroom, and will soon be seen on KUF-TV (Channel 7 on Suddenlink in Abilene). A teaser trailer can be viewed here. Fair Park is known today as Rose Park (at the intersection of South 7th and Barrow). In its heyday, Fair Park was the site of a racetrack, polo grounds, the home of the West Texas Fair and Rodeo, and the place where Abilene Christian’s football team played its home games. Gibson serves as videographer and editor, while Moore does the research and writing, and appears on-screen as well as doing voice-overs in the videos. The two attended Cooper High School together, but became friends years later at meetings of the Taylor County Historical Commission. Their passion for local history shines through in the videos, which combine present-day video footage and historical photographs to give a fascinating glimpse into Abilene’s history.